Produced in association with the Fashion Design Council of Canada and IMG, Mercedes-Benz Start Up is a new program to discover and promote Canada’s next generation of designers. This year’s finalists showed their collections on October 18, 2011 under LG Fashion Week tents. The runway saw everything from edgy leather looks to bubblegum pink colour blocking–each designer’s aesthetic was significantly different than the last. Following the show, Canadian supermodel announced Martin Lim as the challenge’s winner. His prize: mentorship with industry leaders, a show in next season’s LG Fashion Week, and a spread in Fashion Magazine! Other finalists were Cassie Dee, Travis Taddeo, Triarchy, and Unttld. 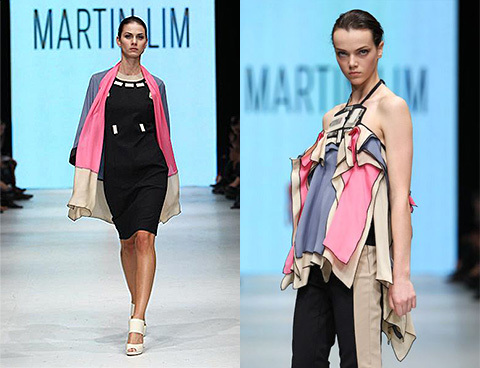 Designed by Danielle Martin and Pao Lim, the Martin Lim S/S 2012 collection was inspired by the joy of traveling and optimism. The collection had a cotton candy palette with shades of cream, pink and blue. Clothes were elegant and wearable, but suffered from over-detailing with unnecessary flourishes and beading. Fitting also needs to be improved; some garments looked like maternity wear when they weren’t. The designers’ use of black piping to separate colors was a unique signature that really popped on the runway—a technique they should strongly consider carrying forward for future seasons. 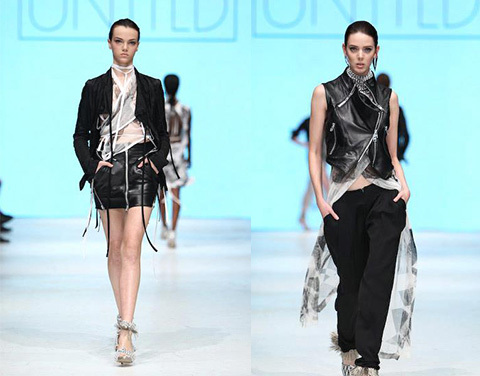 My Favourite: I adored the Unttld collection by Simon Bélanger and José Manuel St-Jacques of Montréal. The duo combined knits, crochet and hand-made silkscreen printing to create a dark and edgy collection that was reminiscent of Denis Gagnon. Unttld sent fantastic asymmetrical jackets down the runway that actually made me utter “cool” aloud. Their clothes folded and twisted around and over themselves to create a unique no-rules vibe. Although they didn’t get the win, this is definitely another emerging brand to watch.